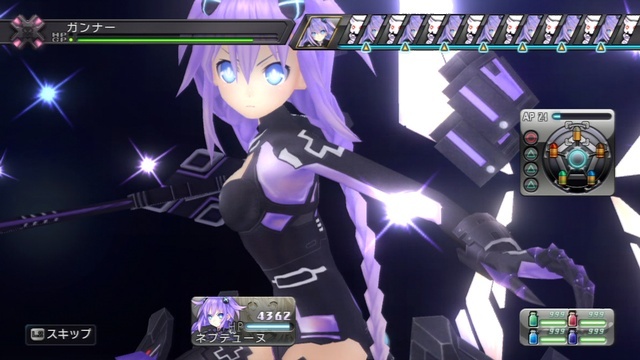 NIS to Publish Literal Console War in the U.S.
You will take control of the Console Patron Unit (CPU) Neptune, the goddess of Gamindustri’s Planetune region, who transforms into the heroine Purple Heart. She is joined by Noire, the goddess of Lastation who transforms into Black Heart, Vert, the goddess of Rinnebox who transforms into Green Heart, and Blanc, the goddess of Ruwii who transforms into White Heart. Neptune will need their aid to save Gamindustri from the evil forces of the goddess Arfoire, whose monsters are ravaging the world. Actually, make that mostly because I have no idea what they’re talking about. Anyway, from what I understand, it’s a strategy game in which you can act out your wildest message board fantasies of finally proving why your favorite console is so much better than somebody else’s favorite console. It’s about time someone figured out to turn GameFAQs into a videogame.